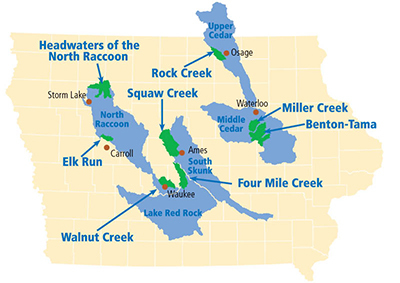 Agriculture’s Clean Water Alliance (ACWA) - an association of 12 agribusiness retailers in the Des Moines and Raccoon River Watersheds - and partners are leading a demonstration and implementation project in the Elk Run watershed to showcase both in-field and edge-of-field practices that reduce nutrient loss to surface waters. The project will connect the Iowa Nutrient Reduction Strategy goals with activities aimed at reducing nutrient losses from agricultural land. Thus far, farmers in the watershed have implemented a nitrate removal wetland, planted cover crops and have implemented livestock waste management, nutrient and tillage management practices. The project is working towards implementing more of these practices and considering others.